Gas Gas completely reinvents its Enduro range. The new GASGAS XC 2019 boasts a brand new engine and central backbone frame, upgraded geometry and an endless list of new features to add to its balanced whole. A firm commitment to the highest quality and reliability of components characterises the relaunch of the Girona-based brand onto the international stage in the most mechanically demanding specialisation: Enduro in its purest form. 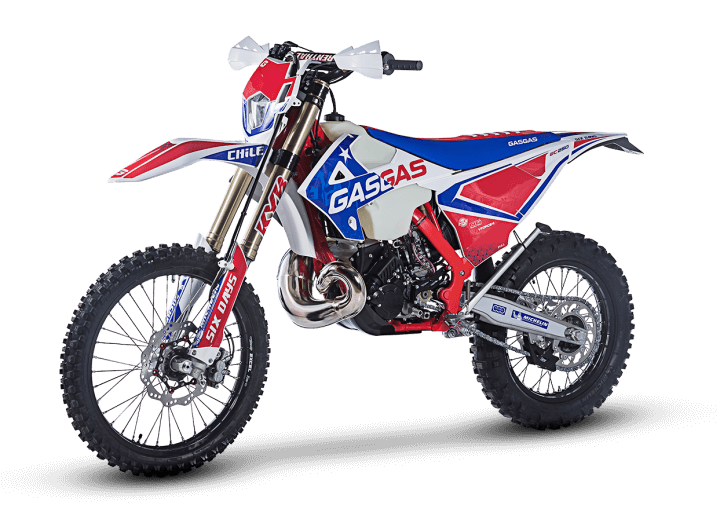 The GasGas XC and EC range have a six-month unlimited warranty and a two-year manufacturer parts defects warranty. Scroll down to see the current range. Gas Gas brings back the spirit of adventure of its legendary Pampera, adapting this go-anywhere bike to the demands of today’s riders with the new ECRanger. Light weight, useable power, easy to handle and suitable for any type of rider, this is the new bike from Gas Gas. The ideal formula for all those who love “light enduro” and “trail excursion” and want to enjoy off-road riding like never before without sacrificing the comfort of the new generation of off-road motorcycles. The coastal town of Viña del Mar, in beautiful Valparaíso, Chile, was the host of the 2018 edition of the ISDE from 12th to 17th November. On the ninety-third running of the most long-lived event in Enduro racing, GasGas wanted to celebrate with a special edition. Decorated with the colors of the flag of the host country and with adorned with special components, this bike is a highly exclusive model of which only 400 units will be produced worldwide. Based on the 2019 GasGas Enduro range, the new special-edition Six Days Chile models incorporate Renthal handlebars with central bar and grips to provide better feel at the hands of the rider. The Gas Gas E10 enducross has been designed to offer all the safety guarantees as children learn gradually, with a motor that can be programmed from an smartphone and LiMnCo batteries, which weigh less and have incredibly more “kick” and autonomy. The Gas Gas E12 enduro has been designed to offer all the safety features as children gradually develop skill and confidence, with a motor that can be programmed from an Smartphone app and a clever ergonomic design to adapt to the child’s growth, including long suspension travel.